Hey everyone! I figured that since I am moving in a couple of weeks (and thus getting to redecorate everything...YAY!!) I would share what my current studio apartment looks like! The part of my apartment that I am most proud of is my entryway/bar cart. Yes, it's both! When you have such a small studio apartment (thanks city living) you have to try to make things have multiple purposes! 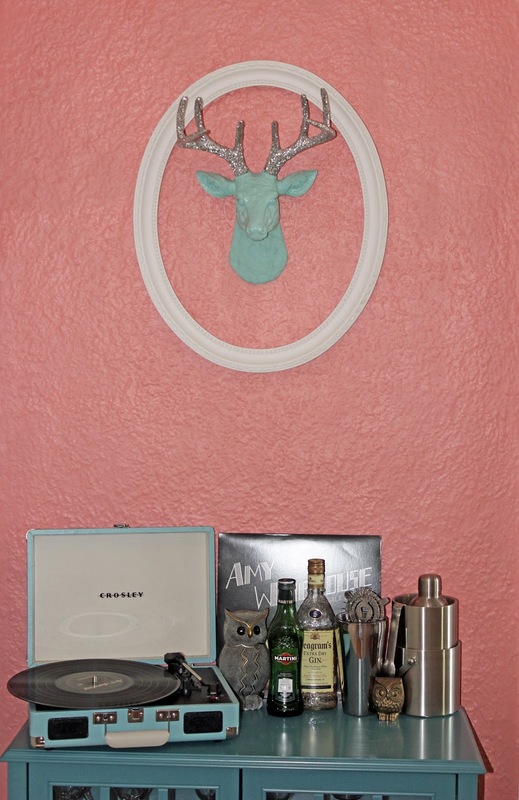 I painted the small wall a pinkish/coral color. (Sorry about the photos - there is zero natural light on that end of the apartment.) I then decorated the small area with a combination of vintage, retro inspired, and handmade pieces. Anytime I have friends over they first thing they compliment is my eccentric glittered deer. Isn't he cute?!?! For more bar cart inspirations follow my Pinterest Board.